KIM LAWTON, correspondent: The famine in East Africa continues to worsen with humanitarian officials now saying that more than 12 million people are in need of emergency food assistance. The United States this week announced an additional $117 million of aid for the region and urged other nations to follow suit. More than 400,000 Somali refugees have flooded into camps in Ethiopia and Kenya seeking help. 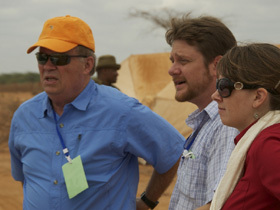 This week, former US Ambassador to the UN World Food Program Tony Hall was in Kenya visiting one of the largest refugee camps. I spoke with him there via Skype. Well, Ambassador Hall, tell us about the conditions that you’ve being seeing on the ground there. AMBASSADOR TONY HALL (Former US Ambassador to the UN World Food Program and Executive Director, Alliance to End Hunger): Well, the situation on the ground, it’s bad and it’s not getting any better. I think that the sheer volume of people that are coming over the border, it’s overwhelming. I must say that the UN and the NGOs that are working on the ground are doing a great job. I think the people that are donating money, I think they, you know, they ought to feel good about the fact that their money is getting through. These programs are working. People are being served. But the volume of people, I mean, and the volume of the problem is amazing. Twenty-nine thousand children have died in the last 90 days. Four-hundred thousand people have been fleeing from Somalia because of the tremendous amount of violence and coupled with the drought—these people have not only been fleeing because of violence, they’ve been fleeing because they’ve lost their livelihood. LAWTON: What are the biggest challenges the aid groups face right now? HALL: I think the biggest challenge probably is the sheer volume of people that are coming. Fifteen-hundred people are coming over the border every day. I mean, they’re walking for, you know, a month-and-a-half to two months. I mean, can you imagine? I mean, I can’t imagine this, but they’re walking basically with whatever they can carry over a desert. In some cases they’re walking a hundred to two hundred miles, and they’re fleeing a very violent terrorist group. They have to also be very careful about, you know, these gangs, and they’re out there, thugs that are out there robbing them of whatever they have. The women are very susceptible to being raped along the way. They arrive, and when you see them, I mean, they are exhausted. Many of their children are malnourished, but, you know, they have this tremendous gift of wanting to survive, and, you know, when they get here you see a little bit of hope in their eyes even though they’re exhausted and thin and malnourished, and they think, well, they’ve arrived, and there’s a little bit of hope here, because there’s water and there’s food and there’s a place for them to stay, and that’s pretty neat. LAWTON: How can you make the case for more aid, more donations coming in in the face of this global economic crisis we’re seeing here in the US, the stock market, and around the world? How can you make the case for people to give? HALL: Our country has always been generous. Our country is a country that is known for its humanitarian aid, its development assistance, not only in our own country but overseas. That’s what we’re known for, and I think for us to reach out and to, you know, to help the least of these is—it shows moral authority, and it shows what we’re all about. LAWTON: Ambassador Tony Hall, thank you very much.